Have you ever wondered how an excavation gets started? The story of the Tel Shimron Excavations, which appears in the latest issue of Biblical Archaeology Review, begins with an email. What a question for an archaeologist! I had been digging at Ashkelon for the past 25 years as part of the Leon Levy Expedition to Ashkelon, and I could not have been happier where I was. But we reached the stage at Ashkelon where we had decided to stop excavating in order to process all that we had found. The publication process was fully underway, but it was clear that future excavations would happen somewhere else. So when the email came from my longtime friend, Dr. Robert Cooley, it was not an idle question. Dr. Cooley is not only an archaeologist; he is also the Vice Chairman of a new organization, the Museum of the Bible, which opened in Washington, D.C., last year. He wanted the museum to support research into the cultures that produced the Bible, including original archaeological investigation at the highest levels. Dr. Cooley and I agreed that excavation in Israel could uncover information about the cultures that preceded and accompanied the writing of the Biblical text as well as those cultures that were themselves shaped by these documents up to the present day. Indeed, as Biblical Archaeology Review has shown over the decades, it is these Biblical texts—their background and infl uence—that are responsible for the extraordinary interest in the archaeology of Israel, even when the discoveries are not narrowly focused on Biblical history. It is widely understood that archaeologists working in Israel have been instrumental in shaping our understanding of this text throughout the 20th and 21st centuries by helping us all to understand the cultures that produced these texts. This contribution is wonderfully illustrated in books such as Life in Biblical Israel by Lawrence E. Stager and Philip J. King and Stone and Dung, Oil and Spit: Jewish Daily Life in the Time of Jesus by Jodi Magness. Dr. Cooley and I met with key decision makers at the museum, and they agreed with this vision. They wanted to see archaeological excavation bringing the very best scholars from all perspectives with the singular goal of understanding this key region’s history through a rigorous archaeological excavation. They committed to letting us follow the evidence wherever it led. Now it was up to our team to do excellent archaeology and to justify their confidence in our skills. But where to go? Just before Dr. Cooley’s email, I had been traveling across the northern part of Israel with Dr. Matthew Adams, Director of the W.F. Albright Institute of Archaeological Research in Jerusalem. As he and I drove through the Jezreel Valley—ancient Israel’s most important thoroughfare—he was telling me about his new Jezreel Valley Regional Project. This project was attempting to collect information about the whole valley in all periods using a variety of new technologies. I have great respect for Matt’s ideas, and I could see the potential of working in a setting that had this kind of collaborative thinking at its heart. And, as I traveled across the valley with Matt, I knew there was one ancient ruin that I had been thinking about for more than a decade: Tel Shimron. As it turned out, this same location was on the mind of my close friend, Dr. Mario Martin of Tel Aviv University, Co-Director of the Megiddo Expedition. Mario had spent the past 20 years at Megiddo, just across the valley. But as he drove past Tel Shimron, he had also been contemplating excavating such a mound one day. Tel Shimron is one of the great multi-period sites in northern Israel, but the ancient city is not known in the modern imagination because no one has ever excavated it. It is the largest mound in the Jezreel Valley, and it was inhabited from the late Neolithic period (c. 5500 B.C.E.) through modernity. We know of it from ancient texts ranging from the Egyptian execration texts of the early second millennium B.C.E. though the Jerusalem Talmud of the fourth century C.E. It was never far from the forefront of events in Galilee during the Amarna period of the Late Bronze Age, during the times of the Hebrew Bible, and even during the time of the First Jewish Revolt, when the Jewish historian Josephus was defending Galilee. Tel Shimron is exactly the type of unknown site that had been awaiting exploration for generations. As Co-Directors, Mario and I, along with much of the Ashkelon team, jumped at the chance to investigate such an important city. One of Tel Shimron’s most valuable characteristics is its chronological breadth. Sites that are inhabited for thousands of years are particularly interesting for archaeologists because of the way in which long-term studies provide a context for each individual period. We understand the nuances of the Iron Age better if we understand the Crusader period in detail. Together, the diff erent epochs allow us to see what is typical for the region and what is unusual. For my part, though Ashkelon and Tel Shimron are chronologically similar in scope, they are quite different in most other respects. Ashkelon is in the south; Tel Shimron is in the north. Ashkelon is a port; Tel Shimron is farther inland. I wanted a contrast that would allow my work at Ashkelon and at Tel Shimron to inform each other on questions of ancient subsistence, economy, politics, and religion. For Mario, the rationale was somewhat more local—but equally interesting. How would Megiddo compare to Tel Shimron? Was the Jezreel Valley something that united cities or divided them? Were Megiddo and Tel Shimron strong at the same time, or did they rise and fall to diff erent rhythms? The timing could not have been more auspicious. 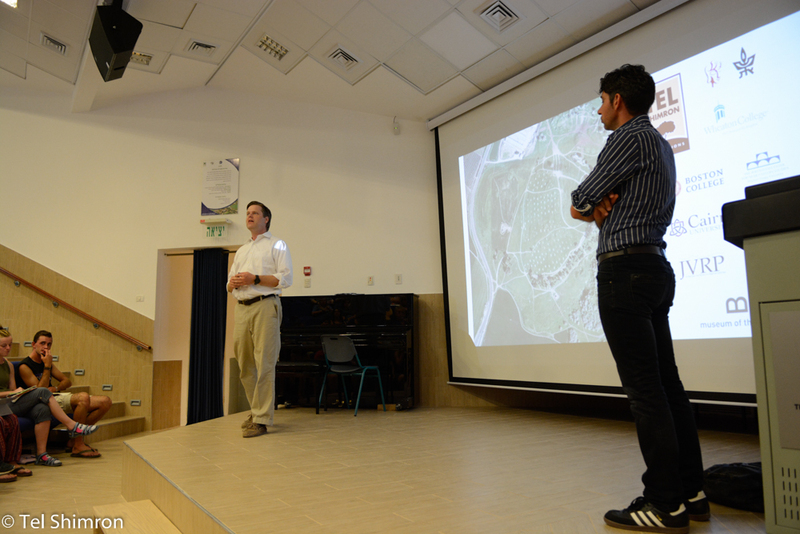 When we met with the Israel Nature and Parks Authority, they were eager to work with us. They connected us to the Jezreel Valley Regional Council, who enthusiastically introduced us to community members in the towns of Timrat and Nahalal. Those communities, in turn, embraced the project as their own. And together we connected to communities all around. Before a single volunteer showed up from the United States to work with us at Tel Shimron last summer (2017), we had already hosted more than 450 visits from local schoolchildren. The Israeli community around us—Jewish and Arab—wanted this excavation as much as we did. Mario and I needed to be sure that we had the expertise to do justice to such a magisterial site. In 2017, we had a staff of 40 people, including 20 with Ph.D.s in their respective fields. The team included botanists, geologists, physical anthropologists, microarchaeologists, zooarchaeologists, and paleographers—not to mention stratigraphers, ceramicists, conservators, and spatial analysts. More than this, each period needed its own specialists. In the second millennium B.C.E., for instance, the Bronze Age city covered some 40 acres and had a population approaching 4,000 people. So we assembled a team of field staff members who had directed excavations at Ashkelon and Megiddo and had served on the staff of excavations at Ashkelon, Tell ed-Dab‘a, Megiddo, Tell es-Safi, and Alalakh. These are some of the key cities of the Bronze Age, and bringing this type of breadth to Tel Shimron was critical. We could see the effects of such expertise in 2017. One day we found an unusual steatite cylinder seal with motifs linking Shimron to Syria. A few days earlier, in the same place, we had carefully sampled seeds for radiocarbon testing to connect our finds to the Middle Bronze Age deposits from Tell ed-Dab‘a in Egypt. All the while, we were finding pottery with close ties to the Bronze Age ceramic sequence at nearby Megiddo. We needed every bit of the expertise we had assembled. What we found at Tel Shimron in 2017 surpassed our expectations. Just as we had hoped, Bronze Age buildings were easily accessible across wide swaths of the mound. We touched the Persian and Hellenistic period—at least enough to see how the site was connected to Mediterranean influences. And then, in the Roman period, we saw all the hallmarks of the reaction of the Galilean Jewish communities to Herodian cultural impositions. The pottery forms became relentlessly local, stone vessels (often linked with ritual purity) appeared, and we even saw the introduction of ritual baths in houses. In short, we saw the Judahized culture of highland Galilee at Tel Shimron. This was a fitting setting of the stories of the famous rabbis of the Mishnah and their visits to the Jewish communities of Tel Shimron. We have just started, and future seasons will allow us to study all periods in which the mound was occupied, from the Early Bronze Age through the rise of Islam to the modern occupation on the slopes. From what we saw in 2017, Tel Shimron will live up to its reputation as one of the great ancient cities in Israel. The ruins will surely continue to surprise us, and we could not be more excited that we have the opportunity to be the archaeologists who started to dig at a place of our choosing: Tel Shimron. Have you ever thought about participating in an excavation? We are now accepting applications for the 2019 field season. The blog is back! Over the next few months we'll be posting video tours of the site and each of the excavation areas. 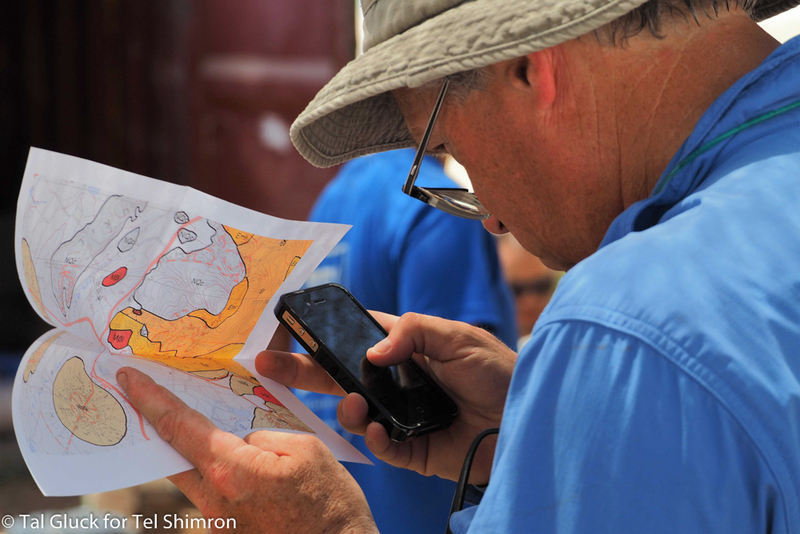 We'll also speak with staff members about their research goals and the work they do at Tel Shimron. We'll even highlight some of the artifacts we found during the first season of excavation in 2017. Finally, as the 2019 season approaches we'll help volunteers prepare with posts on what to pack, what to expect, and more. That's a wrap. The first season of Tel Shimron is in the books. Fair to say right now, the supervisors are in the books too. Deep, deep in the books linking top plans, finishing notes and finalizing stratigraphic relationships. We learned a great deal this first season. In Grid 92, we excavated MB domestic contexts. In Grid 94, we excavated a Late Hellenistic/Early Roman mixed use domestic-industrial courtyard. And in Grid 23/24, we excavated a Roman, Byzantine and Early Islamic neighborhood. Thank you to all the staff and volunteers who made the 2017 Tel Shimron field season such a successful one. See you next time! Thank you Valerie Tewell for this drone shot of the volunteers during their final tour of the tel! Yesterday evening volunteers and staff had an opportunity to view some of the season's best artifacts at Tel Shimron's first ever Finds Display. Afterwards, members of the expedition and the local community enjoyed a lecture by Co-Directors Daniel Master and Mario Martin summarizing the results of our first season of excavation. We still have work to do, however. We aren't finished yet! Grid 94 had their final photos today. Grids 92 and 23/24 have their photos tomorrow. We have also started our inventory of the artifacts and, believe it or not, our tear-down of the pottery compound. We have one more day and a few more pictures to post so check back this weekend as we say goodbye to our volunteers and officially conclude the first season of excavation. Earlier in the season we were visited by Israeli photographer Tal Gluck. He photographs for geographical magazines worldwide and has had exhibitions in Japan, Germany and Israel. You can see more of his work on his Facebook page. The pictures below were taken by Tal when he visited Tel Shimron. As we near the end of the 2017 field season, our thoughts turn to future seasons and where we might want to dig next. One way to answer that question is to consult the results of the walking survey and/or the GPR survey conducted in 2016. Another way to answer that question is to dig a test trench. This is a probe, usually measuring 2 x 2 meters, in which excavators dig down, recording as they go, to see what they find. If excavation produces "clean" pottery readings, meaning all Persian or all Iron Age for instance, or architecture, chances are, it's a promising area for excavation. In the pictures above, a team headed by Josh Walton investigates the summit of the tel in a hunt for Iron Age deposits. The last week of the season is always a crazy busy one for our GIS team. In addition to their regular responsibilities producing daily top plans, surveying the site, and other assorted tasks, they have to produce grid phase plans and prepare images/models to be used in the end of season lecture. What do we mean by grid phase plans? These are plans that show all the architecture from each occupational horizon within a given grid. They are, in other words, a key tool in our reconstruction of each phase of settlement at Tel Shimron. Once the phase plans are done, models, some of which might be 3D, will be created to better illustrate (or animate) what we see in the phase plans. A shout out to our stellar GIS team for all their hard work! It's the last week of the excavation! Above, the registrars discuss some artifacts. Co-Director Mario Martin excavates in the field (a rare privilege since he is often too busy). What's a zooarchaeologist to do when she wants to start a comparative collection? Why get someone to dig a hole for her, of course. Professor Kate Birney explains pottery to a student. Co-Director Daniel Master also finds some time to excavate in the field. Even as we keep excavating, supervisors are writing their reports, preparing to draw sections, and double checking that all their books are up to date. In the pottery compound, the registrars are preparing the end of season Finds Display which will give everyone an opportunity to see some of the season's most interesting finds. (We'll definitely share pictures.) The volunteers leave on Saturday and then it is on to staff week when we will finish all our materials processing, put everything into storage and prepare to head home ourselves. Wow! What a week. In Grid 94, they continued their excavation of a mixed domestic and industrial courtyard with sunken jars and plaster installations. In Grid 92, they worked on exposing more of the Middle Bronze Age and in Grid 23/24, the team began dismantling the latest phase of the street and the buildings fronting it. It's a short weekend for us, we are back at work on Sunday, and then it is on to our last week. There is still a great deal to do. We'll be excavating three or four more days before we start sweeping for photos. At the same time, we will start organizing the storage of artifacts, prepare for the final party, and get ready to say goodbye to new friends. We have one more week to make memories and uncover another chapter in the history of Tel Shimron.